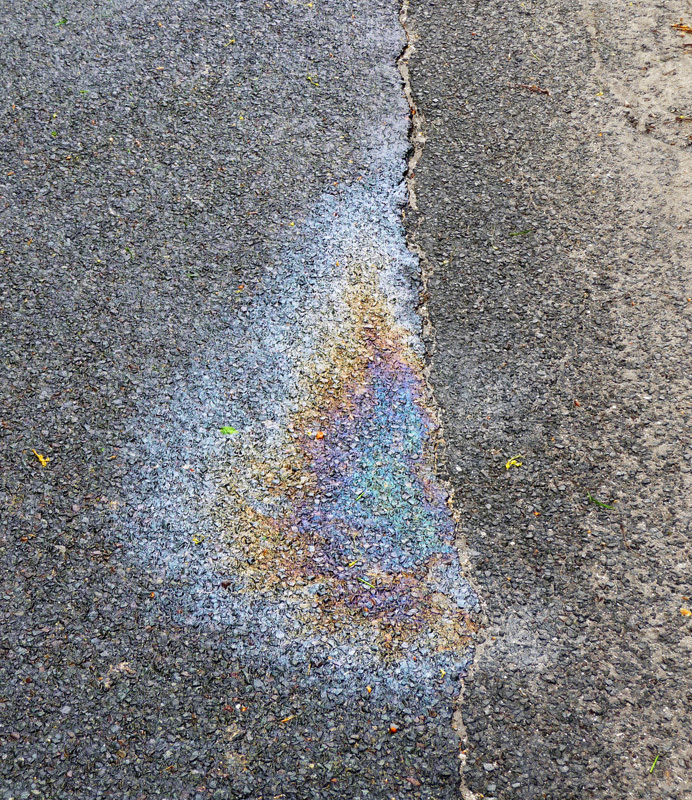 I found this gasoline rainbow on Judith Drive. I'm sure you've seen this phenomenon yourself, and if you're a curious person (I pray you are), you've probably wondered what causes it. It's difficult to explain and usually involves diagrams, but I think I can make it clear in words. ( if I'm wrong.) Once you understand it, other color phenomena will begin to make sense, too. A few drops of gasoline fell on wet pavement. Since gasoline is lighter than water, the gasoline floated. Because gravity tried to pull all the gasoline to the same level, it spread out. It stopped spreading when the tightness of its skin finally balanced the force of gravity. The resulting film was incredibly thin, because gasoline is even waterier than water. Nevertheless, the middle of the film was thicker than the edge, because the skin tightness kept the film mound-shaped by a few millionths of an inch. And that's why the film makes a rainbow. Some of the light waves hitting the film pass through and bounce off the bottom, but when they come back out they are canceled by other waves arriving behind them. Whether a wave is canceled or not depends on its wavelength (color) and the thickness of the film. In the middle of the film pictured above, long red waves are canceled, letting the remaining short blue waves dominate. That's why the middle looks blue. Farther out, as the film grows thinner and thinner, shorter and shorter waves are canceled, letting longer and longer waves dominate. That's why the color gradually changes from blue to violet to red to orange as you travel toward the edge. In short, a gasoline rainbow performs the same selective filtering of colors as a rainbow in the sky. The main differences are that the medium is gasoline instead of water and the colors are filtered by interference instead of bending. And of course there's no pot of gold at the end.